Digital door locks are unique, keyless, programmable locks that can be used to secure any area of your home, from your garage, to your front door, to your home office. 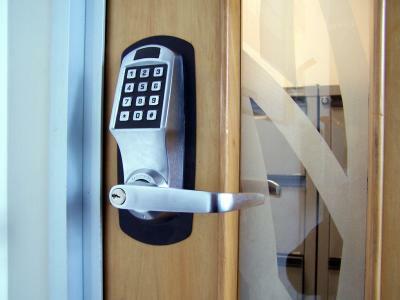 There are several different types of digital door locks, each with its own uses. Learn the difference between them to determine which one is best for you. Digital locks can be defined in different ways depending on what it is they are meant to open, how they are wired to your home and how they function. Users who travel frequently and want a neighbor to check in; the neighbor can be given a unique key code, rather than a key. The code can be changed once the homeowner is home. Single-sided deadbolts are one of the most common types of deadbolt installed on most homes. They work in combination with a second lock installed on the doorknob itself. One side of the deadbolt can be turned without needing a key or combination; the other side requires a key code to unlock. Digital deadbolts can be installed in place of any existing deadbolt. Double-sided deadbolts are essential for doors that have glass panes or panels. Both sides of the deadbolt require a key code to disengage; if the glass were ever broken, the deadbolt could not be flipped by someone reaching in. Door locks can be operated in a few different ways. One of the more common is to use a battery. Battery operated door locks usually have an LCD display, light up when touched and are easy to reprogram using a master code. 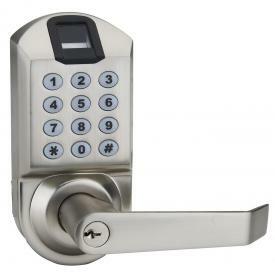 The drawback to a battery-powered lock, however, is that the batteries require changing about once a year; if the battery dies, the keypad function will not work. Most locks do have a low-battery light to help indicate when this will occur. Battery operated door locks are used primarily for door knobs and interior locks; they are not typically used in deadbolts. Many battery operated locks also have a key override; if the battery dies, the key is used to unlock the door. Mechanical digital door locks don't depend on a battery or on electricity to work. Instead, they rely on tumblers like a standard key; pushing in the numbers on the keypads shifts the tumblers to unlock the door. Mechanical locks are bump proof, kick proof and never wear out even with heavy duty use. Unfortunately, you are more limited to the number of digits in a key code, as well as the number of key codes you can use with this type of lock. They are used primarily for deadbolts, exterior locks and high-traffic areas that get a lot of use. Alarm locks blast a loud signal if you try to enter the wrong code too many times, pick or break the lock. They may be wired into your home's alarm system, or they can have their own alarm system that works solely with the lock. They are almost always wired right into your home's electrical system, so there are no batteries. If there is no key override for the lock, however, a loss of power may render it inoperable. For those that don't want to carry a key, or remember a key code, consider getting a fingerprint lock. Fingerprint locks scan your print to unlock the door, no key or code required. These are among the more expensive versions of digital locks available, however, and they may need to be protected from the weather to ensure their continued use. Another drawback to this type of lock is the fact that it can be "picked" if the thief is able to lift your fingerprint and copy it onto a latex glove. Battery-operated and mechanical digital locks install nearly identically to a standard lock. 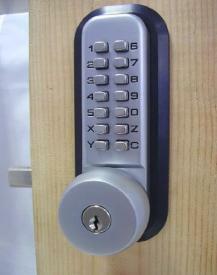 They are usually sized and able to retrofit any existing lock with no modifications or changes to your door or frame. Alarm locks, or locks that require an electrical current must be installed either by the manufacturer or by a certified electrician to fish the line. Alarm locks in particular may require a special alarm box installed on or in the wall near the door. This may require opening the wall or some minor construction. All locks come with a master code that allows you to program them. Most locks allow up to six different codes to be used on one lock at a time, although some locks allow nearly unlimited codes; to change a code, the master code must be entered first. Some mechanical locks can be programmed without the use of a master code. Nearly all mechanical locks allow for codes between one and six digits long, while battery operated and alarm locks may have longer codes. If you desire a mechanical lock with a longer code, additional tumblers are available to customize the locks. 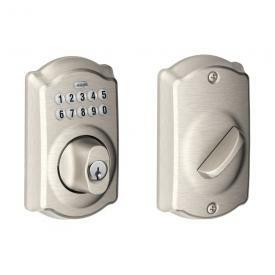 Schlage BE365VCAM619 Camelot Keypad Deadbolt: Schlage gets good reviews from Galt Tech, as well as from consumers. The lock is easy to install, bump-proof, has a long battery life and comes with both keyed and keyless entry. Taft Keyless Electronic Door Lock: Taft has made a simple, keyless door lock that retro fits into any doorknob inside or outside your home. Consumers rate this lock highly for its ease of install and quality of the product. SCYANx7 Fingerprint Keyless Keypad Door Lock: This lock features a system that lets you in by keypad, keyed lock, and fingerprint. The fingerprint system updates after each time you use it, meaning you'll have less trouble using this option than other similar systems. Buyers note the multiple number combinations as a positive point, as well as the ease of using the fingerprint option. All-Weather Mechanical Keyless Deadbolt: This simple, mechanical keyed or keyless deadbolt can be programmed with up to 10 digit codes. Consumers like the durability of the product, as well as its ease of use. Some do say that it can be more difficult to install than a standard deadbolt, however. Master Lock Keyless Electronic Deadbolt: Consumers love the durability and security of this battery-operated deadbolt by Master Lock. It can be difficult for children and some users to operate, however, as there is a steep learning curve. Digital door locks are an innovative way to help keep your home safe. Whether you opt for a mechanical version, or one wired right into your home's alarm system, a digital door lock may bring you more options in how to get some peace of mind.